Words by Kevin Doocey on October 6, 2009 . As it finally seems Mike Ashley will pack his bags and leave Newcastle United, a little premature excitement is creeping in. Not just the fact he’s leaving (or so we are led to believe) but also the reality that we are set to get a local owner, and not many clubs can say that. Today reports say that Mr.Barry Moat has written a letter to Mike with a formal offer, expected to be in the region of £90-95m and we expect our current owner to accept it or God knows what will happen. We rather not think about that possibility to be quite honest. Ashley who attended the Bristol City was being urged, (pleasantly) by the roaring Newcastle United faithful to ‘Get out of our club’ and we think he might have got the idea, because it’s not the first time something along them lines has been shouted in his direction. 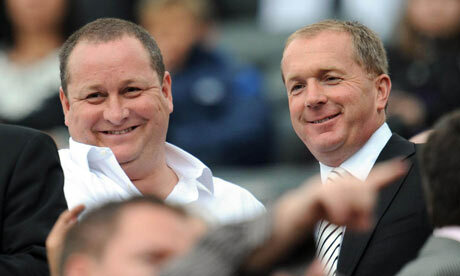 Whether Mike Ashley will finally decide to part with the club and we certainly hope he does, is another thing. We are top of the table and with a bit of strengthening we could get promoted at first attempt. However, Mike’s only looking at the financial side of things and sees a potential money making opportunity should we return to the top flight. We hope he has some sense and leaves while things are at their best. It’s not a good economic climate and getting close to £100m is never a bad thing, that’s for sure, especially when you’re already a healthy millionaire. If Barry takes over, then we could finally have Alan Shearer as manager, permanently, with no disrespect to Chris. However, if Hughton is to stay on as boss and continues his good run, then he’s every right to want to job, and at this stage may well deserve it. This international break would be a lovely time to get things sorted, so how about it Mike?